With over 20 archaeological sites, An Khe township in the Central Highlands province of Gia Lai is drawing much attention from scientists and local authorities have made efforts to preserve and uphold the values of these sites. 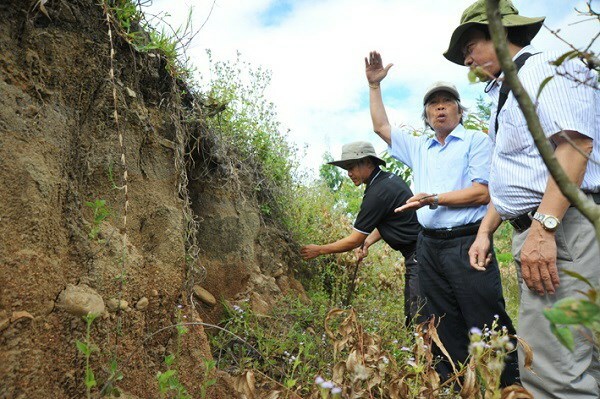 In 2014, Associate Professor, Dr. Nguyen Khac Su, a senior expert of the Vietnam Institute of Archaeology, along with researcher Phan Thanh Toan, made a fact-finding tour to An Khe valley in Gia Lai province. The archaeologists discovered the abnormality from big pebbles that were found unnaturally broken in an ancient river, possibly being the tools of human in the early Stone Age. A meeting was quickly convened afterwards. The Vietnam Institute of Archaeology conducted a ministerial-level research project in the year to expand the study and invited scientists from the Novosibirsk Institute of Archaeology and Ethnography under the Russian Academy of Sciences to join the project. As a result, from 2014 to present, Vietnamese and Russian archaeologists uncovered 23 relic sites dating back about 800,000 years ago in An Khe hillock area, including 12 in Roc Tung (Xuan An commune), Go Da (An Binh ward), Roc Huong (An Tan ward), Roc Giao (Ngo May ward), Roc Lon (An Phuoc ward), Roc Nep (Cuu An commune), and Nui Dat (Cuu An commune). The second international workshop on the Stone Age is scheduled to be held in An Khe on March 29-30. It aims to seek the recognition of the Ministry of Culture, Sports and Tourism for Tay Son Thuong Dao relic site and archaeological sites in An Khe as special national ones.